Gernandt, D. S., A. Liston, and D. Piñero. 2003. Phylogenetics of Pinus subsections Cembroides and Nelsoniae inferred from cpDNA sequences. Syst. Bot. 28:657-673. Gernandt, D. S., G. Geada López, S. Ortiz García, and A. Liston. Phylogeny and classification of Pinus. Taxon, in press. Liston, A., D. S. Gernandt, T. F. Vining, C. T. Campbell, and D. Piñero. 2003. Molecular phylogeny of Pinaceae and Pinus. Pp. 107-114 in Mill, R.R. (ed. ), Proceedings of the 4th Conifer Congress. Acta Hort 615. 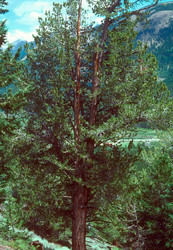 A limber pine (Pinus flexilis) in a limber pine woodland on the flanks of Mt. Audubon, in the Indian Peaks Wilderness area south of Rocky Mountain National Park, Colorado.